I try to randomly pair people into unique pairs. I could easily half the two groups but this does not seem to be the best solution and also not really random if I do it manually. Moritz. Immediately, I notice that your range contains an odd number of items ($A$2:$A$164 contains 163 cells); so not everyone will be paired with someone. In any solution, then, in order to include all names, you'd need to make sure your range always has an even number of cells—in this case one more than there are number of people (i.e., $A$2:$A$165). Also, you'll want to be certain that your File > Spreadsheet settings > Calculation setting is set to "on change" or your list will be regenerated automatically every minute or every hour, depending on which other setting is currently selected. Clear Column B entirely in preparation for an array formula. This will be a "helper column" which can hide later if you like. 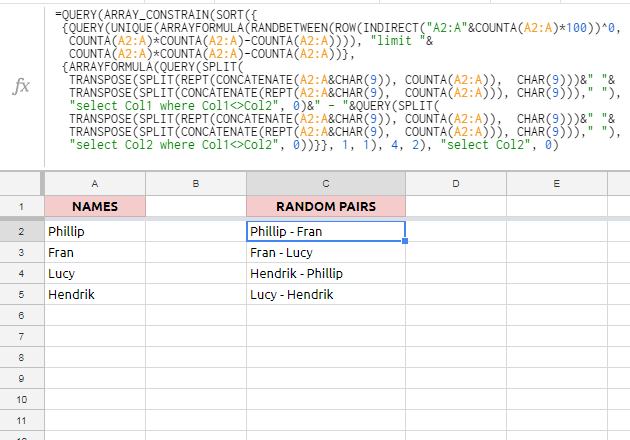 The Column B formula will provide a randomized, non-duplicating list of your names. The Column C formula will take the top half of that list and pair it with the bottom half. You can't (to my knowledge) merge this into one formula, because randomizing functions are triggered by each sub-formula within a longer formula, so you'd wind up with duplicates. 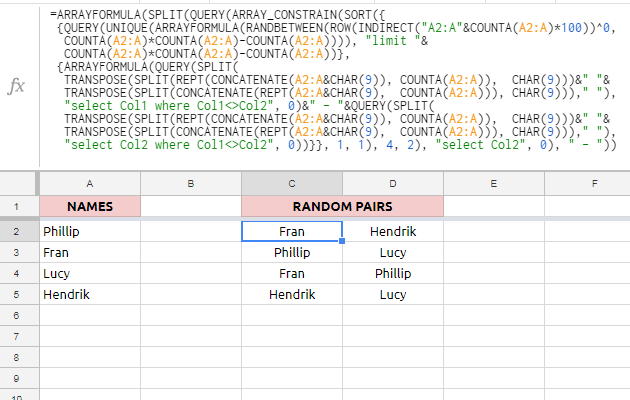 By creating a single helper column with RAND(), we can refer to it with the other formula while not getting duplicates. Not the answer you're looking for? Browse other questions tagged google-sheets formulas google-sheets-query google-sheets-arrayformula concatenate or ask your own question.